We're here to help. If you can't find the relevant support & FAQ below please contact us directly. If you have any questions please submit them to info@ritonusa.com or call us on 855-397-4866. We really appreciate our customers feedback and will get back to you as soon as possible. What’s the difference of quality between your Mod 5 and Mod 7 line? The difference is the Mod 7 line has higher zoom power, different reticles, larger tube size, better turrets, and argon purging instead of nitrogen purging. What is your Mod 3 line optimized for? Our Mod 3 line is a high-quality optic with a great price point that is optimized for a standard AR platform in a .223 or 5.56 caliber. The Mod 3 2-7×32 specifically has a Bullet Drop Compensated (BDC) reticle for a .22 long rifle. Do you offer a Horus reticle? We do not currently offer a Horus reticle. Our Riton scopes rated for air guns? Do you have zero stop turrets? Our newest product, the Mod 7 4-32×56 has zero stop turrets. This scope will be available soon. What scopes are compatible with your throw levers? Our throw levers are compatible with our Mod 1’s, Mod 3 GEN2’s, and Mod 5 GEN2’s. What scopes come with a Sun Shade? Our Mod 7 4-20×50 and Mod 7 5-25×56 come with a sun shade. Our sun shades will fit the Mod 5 4-16x50FOV, Mod 3 6-24×50 and Mod 5 6-24x50IR. Can I purchase a sun shade on it’s own? What is the minimum range that your parallax adjustable scopes can focus? It depends on the scope, but most of our models start at 10. How do your scopes perform in low light? This is where our scopes shine. Because we use high quality HD Japanese glass in all of our optics, we average 99.5% light transmission so you’ll be able to see better through our scopes in low light than you can with your naked eye. What scopes do you have in First Focal Plane (FFP)? 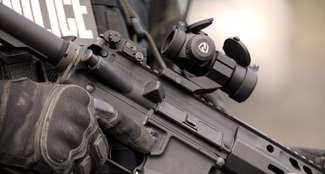 Our Mod 5 6-24x50IR, Mod 7 5-25x56IR and Mod 7 1-8x28IR-T.
Are the Riton reticles etched? Yes, all Riton reticles are etched. What torque specs do you have for your rings and bases? Riton recommends 18 in/lbs for our rings. Our base nuts can be tightened to 45 in/lbs. Can I change the Reticle in my scope? This is not currently a service Riton Optics offers. What type of glass do you have in your optics? Currently, there are no American manufacturers that can supply enough high quality, HD lenses to support our needs. Thus, we source all of our glass for each and every optic from Japan. You can expect high quality HD (High Density) glass in every optic. The source of the base material is not nearly as important as the optical design. Our glass is so much clearer due to our proprietary lens coatings, how we engineer the prescription of the lenses, and the construction of the optic itself. Where is your final assembly? All of our optics have hand sourced Japanese glass and are final assembled in Japan or China depending on price point. We source all of our raw materials and use oversees assembly based on price point. What is the difference between First Focal Plane (FFP) and Second Focal Plane (SFP)? First focal plane scopes have the reticle installed towards the front of the erector tube or forward of the magnification lenses. When the magnification is increased, the reticle increases in size along with the image you are looking at. The advantage to this FFP is the reticle subtentions stay the same through any magnification. With an SFP reticle, the spacing for holdover in the reticle is only correct at one magnification, usually the highest setting. If the scope’s magnification is set lower, the size of the reticle relative to the target changes and the increments of the spacing will change. Parallax describes a situation where the focal plane of the object in the scope is offset from the reticle. If you have parallax, you have an optical illusion that must be corrected. Parallax should not be confused with focus. Parallax compensation changes neither the focus of the reticle nor the focus of the image; it simply moves the planes at which these two objects are in focus so that they share the same plane. At Riton Optics, we stand by our promise to be here for you and to provide you with the best possible customer service experience. 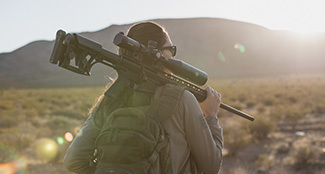 If you are not satisfied with your purchase, we offer a 30-day money back guarantee if the product was purchased direct from Riton Optics, has not been mounted, is not scratched or blemished in any way, and is returned to us in the original packaging. Products with wear and tear or damage caused by improper use or accidents will not be covered under the Return Policy. If you wish to return a product not purchased directly through Riton Optics, please contact the original dealer from which you made the purchase. If your item has a manufacturing defect in it’s materials or workmanship, you can return it at any time for a full replacement under our Unlimited Lifetime Warranty. Please see our Warranty Page for more details. Please send your return request to returns@ritonusa.com, and include your name, email and original order number. A Riton team member will be in touch within 48 business hours to assist with processing your return. Refunds will be processed within 7-10 business days after we receive the product in it’s original condition. 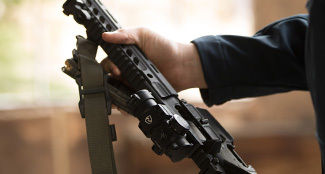 Riton is proud to offer a substantial discount program to Military/LEO/First Responders & those in the industry. Do you offer a military discount and how do I apply? Yes, we offer a Military, Law Enforcement and First Responders discount of 40%. You can apply on our website: Discounts Programs. You will need to fill out the page form and then upload a picture of an ID badge (front and back), a copy of your DD214 (for military), or show proof of a military/agency email account. Once we have approved the submitted documents, a coupon code will be issued for the individual within 48 business hours or less. Yes we do! We offer a substantial discount to those in the industry. Please contact info@ritonusa.com to inquire. 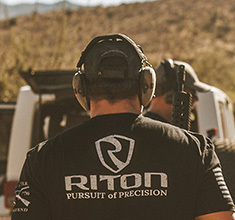 Eligible industry discounts will be at the sole discretion of Riton Optics. You will be required to provide proof of employment. Do you offer dealer discounts or purchase programs? Absolutely! We offer a dealer program with some of the most aggressive dealer margins in the industry. To inquire about becoming a dealer, email sales@ritonusa.com for more info. Its FREE on standard order! Any orders placed with Riton will receive FREE standard shipping within the U.S. Please note that Puerto Rico and USVI are excluded from free shipping. Promotions and specials may also be excluded. We do not currently ship outside the U.S.
Are the rings covered by the Unlimited Lifetime Warranty? Yes the rings and mounts are covered. Will you still honor a warranty if I re-finish/Cerakote my scope? We will warranty the scope as long as the damage did not occur from the Cerakote application. It must be done by a certified applicator. If something is damaged/defected with the scope in the future, we will warranty your scope, but will not reimburse for the price of the Cerakote. How long will a warranty take to ship out? We do our absolute best to process and ship any warranty item within 2 business days of receipt.